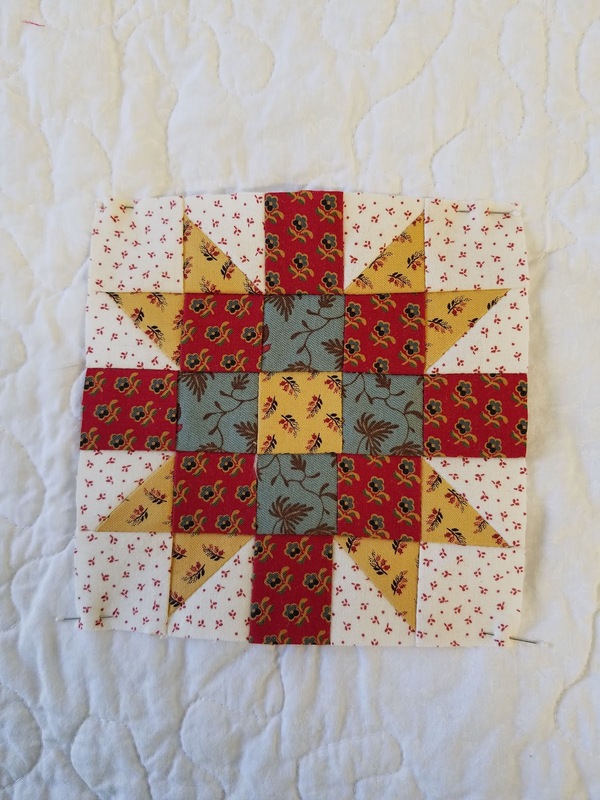 I started a BOM from Gay Bomer of Sentimental Stitches. The blocks are taken from an old quilt from the late 1800s. Each month directions will be provided for five blocks-one large block 12 inches finished-and four small 5 inch blocks. No block names are given but the large block is Rolling Stone. The green block is Square in a Square. The blue block is Birds in the Air. I don't know the other two blocks. I'm calling the bottom right "the Knot Block". 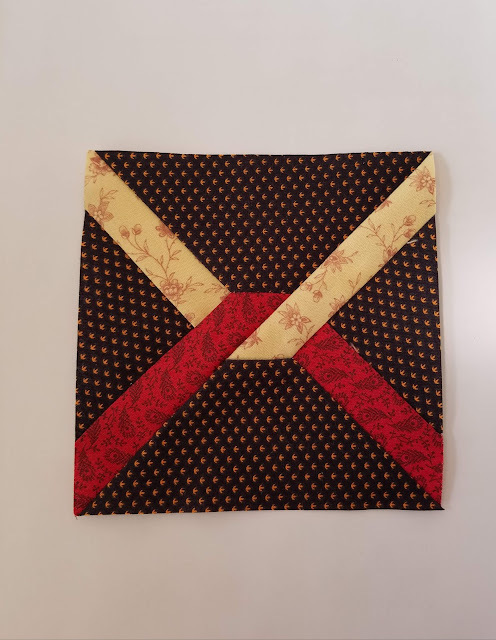 I stitched this knot block by hand and it was rather wobbly so I made another one on my machine and it has turned out much better. Y-seam construction. Not so hard to do especially since I once made a whole quilt of stars using Y-seams. You have to hold your tongue just right. Isn't this a darling little block? Maybe a Weathervane, not sure. 5 inches! The BOM is free the first month and available for purchase after the month. On-going for 14 months. Very potato chippy. I went shopping in Freeport with a friend recently. She bought luscious yarn at Mother of Purl for a pair of mittens. 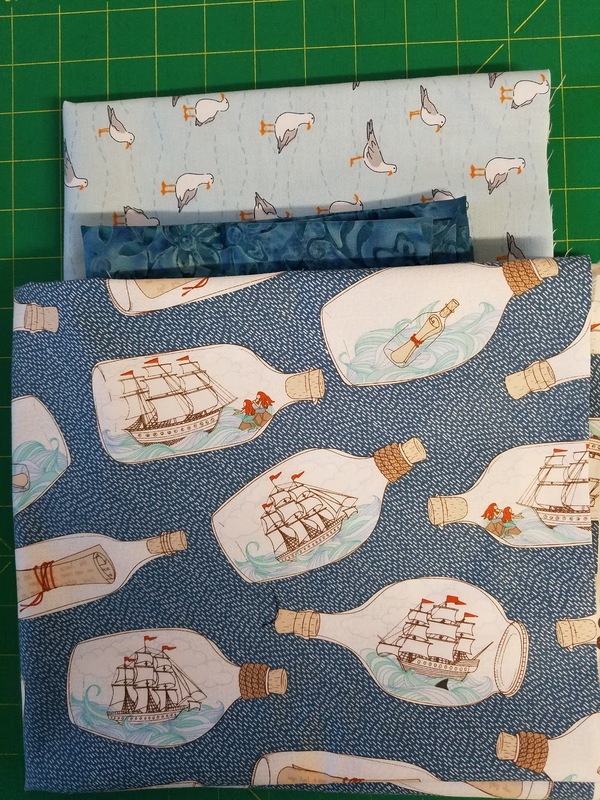 I bought a bag pattern and fabric at Cotton Weeds. 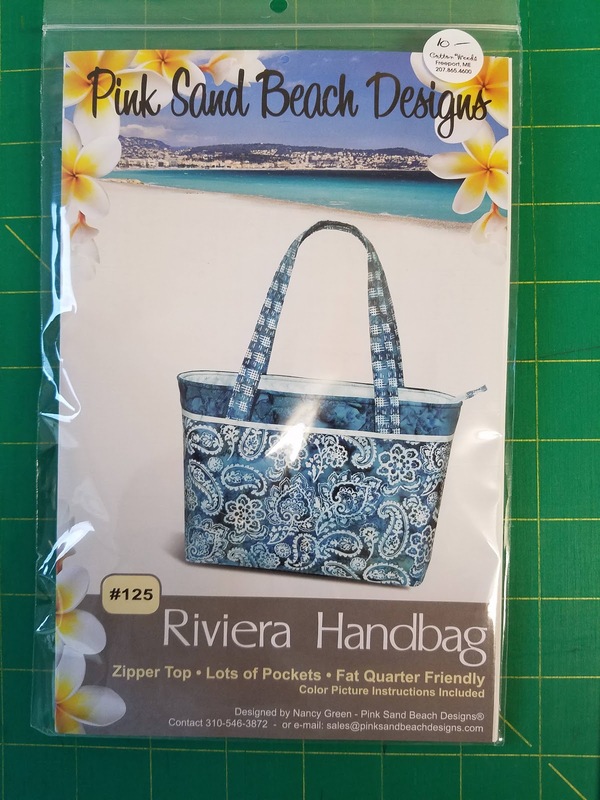 I think this will be a fun bag for the summer. There was a sample bag made up at the shop so I got to see the size and have a look inside. Lots of inside pockets and there is a zipper to keep my belongings safe. The owner at Cotton Weeds kindly labeled my fabrics so I know what is what. I was going to buy Bosal for soft interfacing but they were out at Cotton Weeds, so I have decided to use the leftovers from other bag projects. I kind of grit my teeth about making bags, but will put the effort into making this one. I just have to make the time to get it done. Did you read about the many Barred Owls in people's backyards? The poor birds were so hungry they were hanging out at birdfeeders hoping for a meal of squirrel or small bird, I assume. 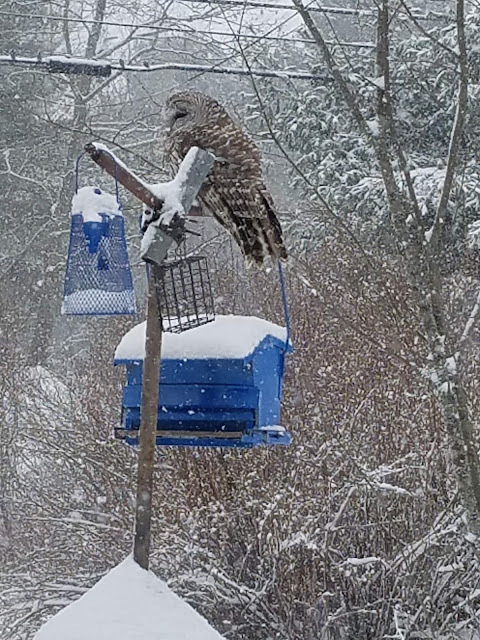 Our Maine winter of snow and thaw made the snow crust too tough for the little birds to break through for mice or whatever they eat. I became quite attached to this little one and hope he/she made it. This is the third applique border for my Jan Patek BOM from last year. 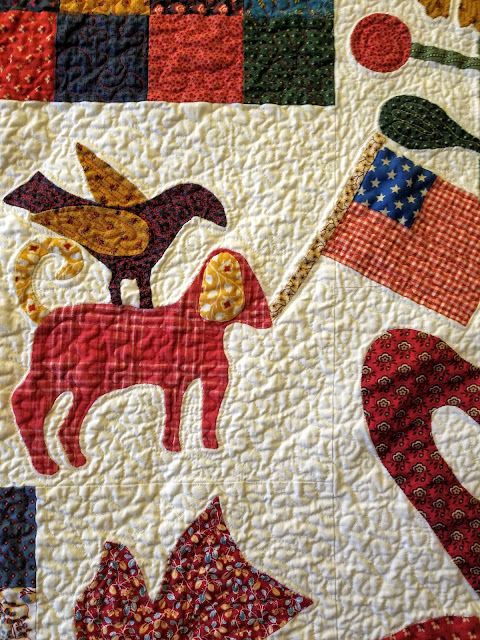 I've really enjoyed the applique but I am ready to get the quilt finished. One more to go! For some reason (avoidance of working on UFOs!) 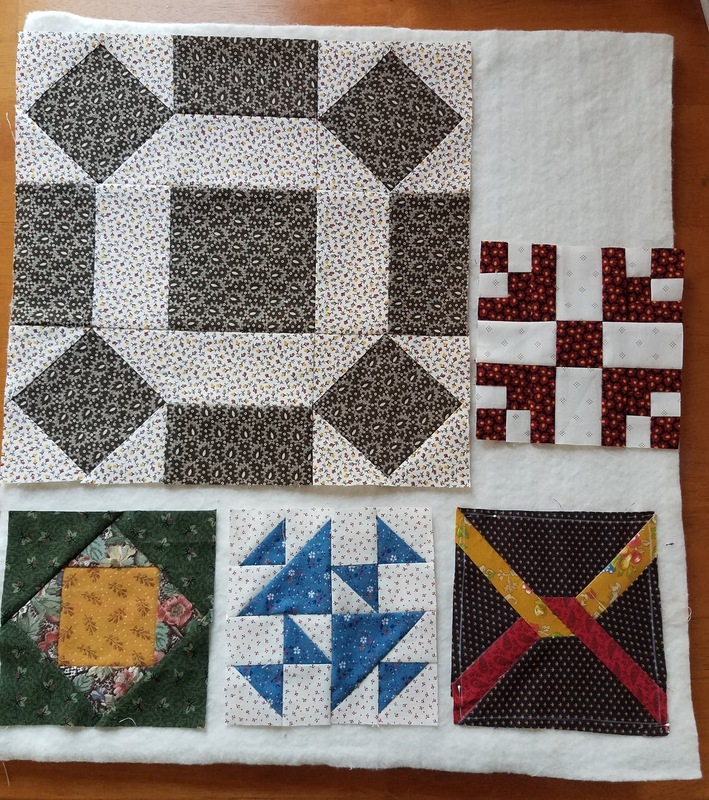 I decided to work on a little quilt last week. I have a copy of Gai Perry's book Color From the Heart. There are a number of challenges in the book involving color. 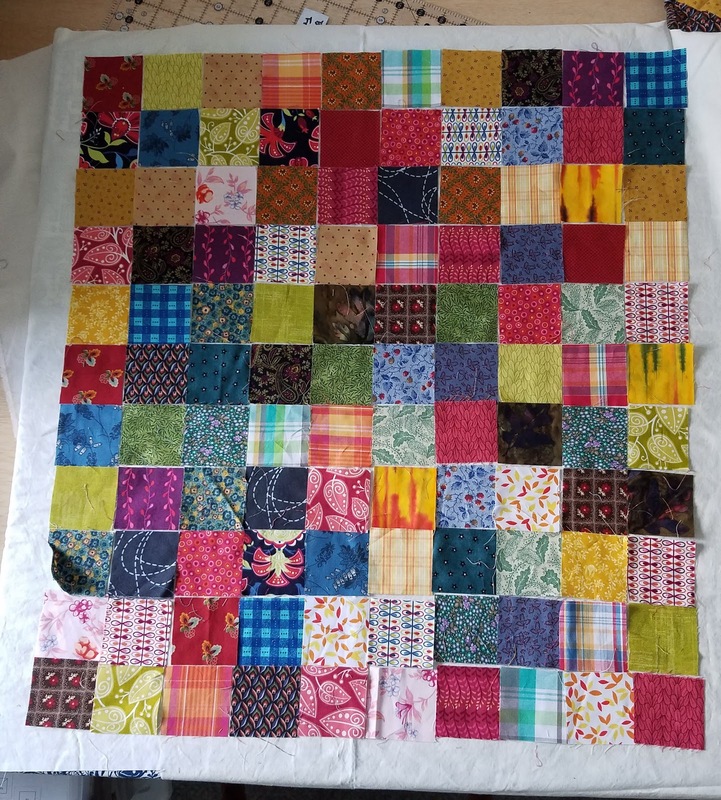 The first challenge was to cut three 2 inch squares from 40 different fabrics. Those squares are put in a bag and then you pick them out randomly and set them one by one in the rows as above. You are allowed to rearrange a bit at the end, which I did somewhat. 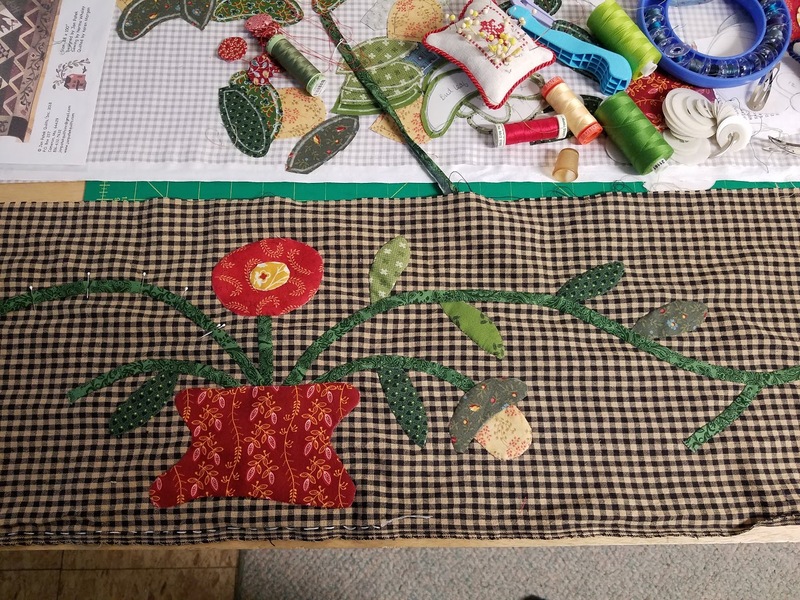 I'm also working on an embroidery project and signed on for "Cheddarback" a BOM from Gaye Bomers of Sentimental Stitches. Five blocks each month. How hard can it be to find the time for that? I so enjoyed the Edyta Sitar BOM last year and this will be similar. Also signed up for a wall hanging with Back Roads. The temptations are never-ending, aren't they? I set aside my quilting for a few days while I obsessively knit this hat. 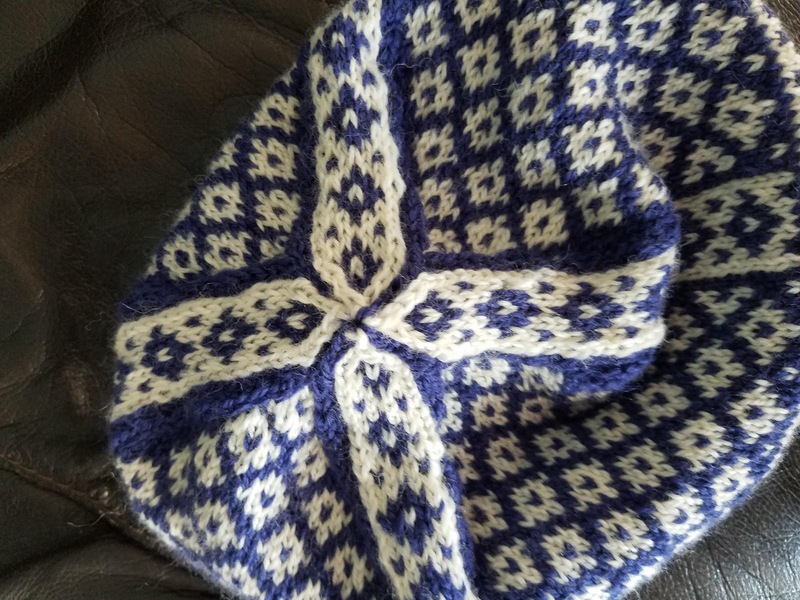 It is the Ullared cap from Charlene Schurch's book Hats On! Oh, it was so fun to knit this hat. I knit this pattern once before but it was too small and I made a mess of the crown decreases. This time around I knit a larger size. I don't like the tight skull cap look. My hat is knit from Plymouth Galway wool from Attic Heirlooms in Damariscotta. 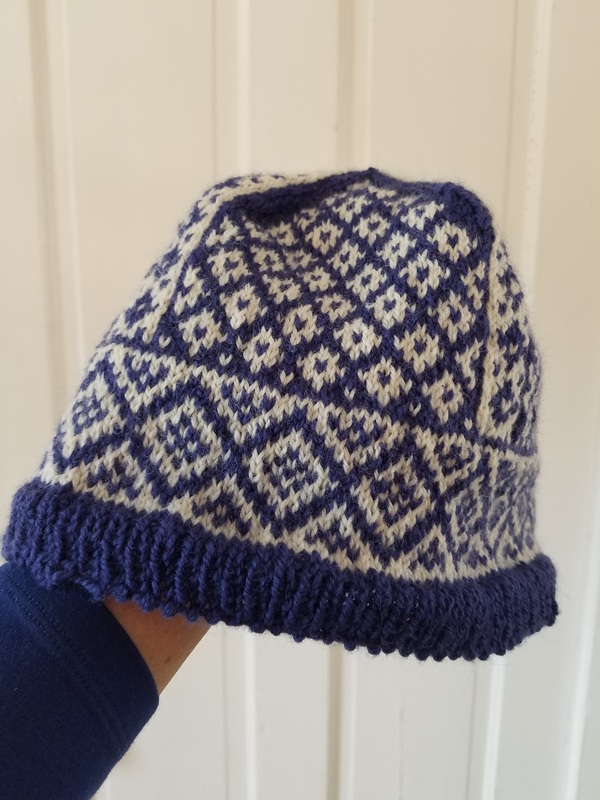 Such a lovely yarn and the hat is warm and cozy. I bought more yarn to make a pair of mittens. My poor wrist is quite sore from all this intense knitting. I gave up knitting while I was working because my job required me to be on the computer all day, so I needed to take care of my hands. Now that I'm retired I took up knitting again, but this project was too much. I have always knit "English style" but taught myself how to knit "Continental" to save my wrists. Unfortunately, I thought I could do both with this hat, white in my left hand and blue in my right hand, but that was still to much for my right hand and wrist. Once I am fully recovered, I will hold the two colors in my left hand and also limit my knitting time every day. My daughter showed me hand stretches and that has been a big help, too. I'm working on the borders for my Jan Patek BOM from 2018. 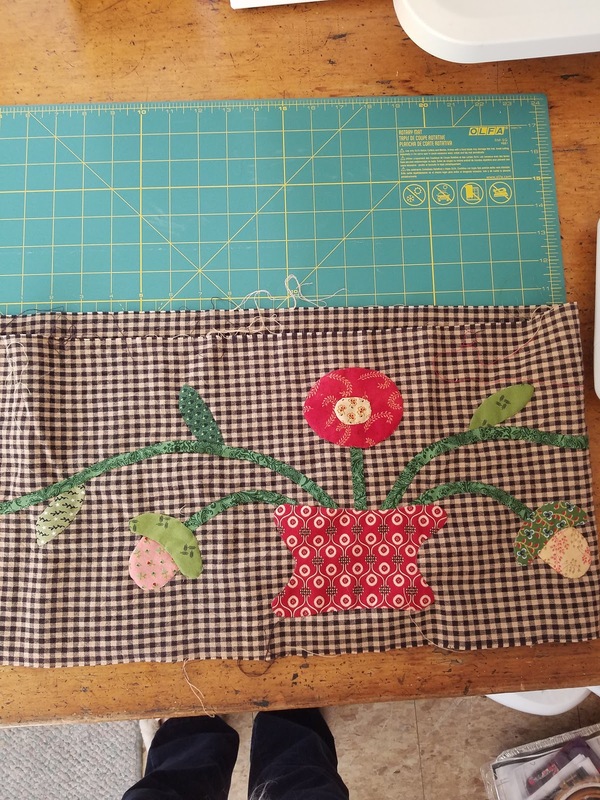 I am enjoying the hand applique and choosing all the fabrics. 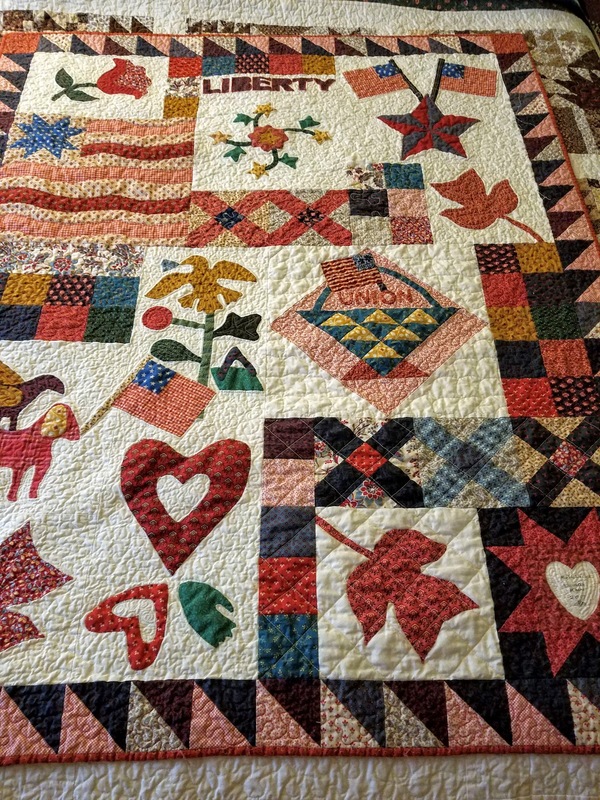 I will be going on a quilt retreat in a few weeks and may take this along with me. If I bring my little bendy lamp, I think I will have enough light for this kind of work. I have not used my sewing machine for a bit as I want to concentrate on finishing up this UFO. I do feel the siren call of a new project but am trying to resist. My Yankee Diary, Barbara Brackman's BOM for 2017, is finished. My intention was to hand quilt this project, but I really did not get very far with that and chose to machine quilt it to get it done in 2018. 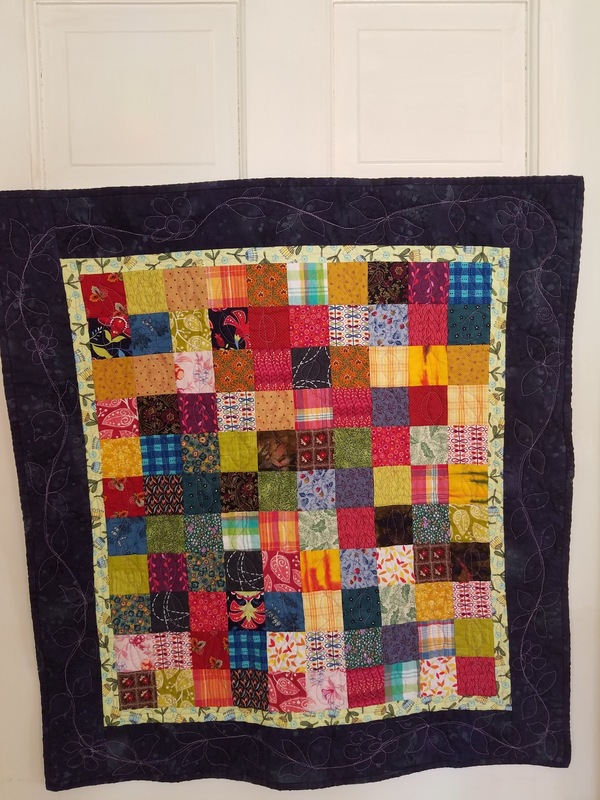 I'm happy with the result-the quilt is light and luscious with texture and did I mention Finished? I'd like to go back and read the Yankee Diary blog entries to remind me of the symbolism of the blocks. Yankee Diary was based on the diary of a young woman, Caroline Cowles Richards -"Carrie", from upstate New York during the Civil War. Her diary was published and a digital version can be seen here. This small quilt is my third UFO completed for my Tacoma quilt group challenge. Three down, seven to go! Visit Beth French's profile on Pinterest.